Enter this code to get 20% off everything. Be sure to check the validity of the code, as it might already be expired, but there are no other site-wide codes at this moment (25 April 2019). PETOFFER8 £20 Argos eGift card Purchase a new Argos Pet Insurance policy online or over the phone. Do not cancel the policy in the first 3 months and receive your eGift card. Source: Argos voucher page and Argos Affiliate Hub. Unfortunately, Argos doesn't offer student discounts at the moment - either online or in-stores. ASOS seems to be the only one merchant (from the big 3 - ASOS, Debenhams, Argos) in the UK offering a 10% student discount (sometimes even 20%) using your NUS card or UNiDAYS account. Below are promotion codes that were available over the last 6 months at Argos. HPOINT10 – 10% off Hotpoint ovens. FURN20 – 20% off indoor furniture (excludes nursery furniture, bathroom furniture and Simba) when you spent £100 or more. SOFA20 – 20% off on your new sofas or armchairs when you spent £250 or more. SCOOTER1 – 1/3 off Westbeach scooters and bikes. VECTOR25 – £25 off Anki Vector Robot. One day only. XMAS30 – 30% off selected Christmas trees and lights. Min spend £20. BEDDING25 – Refresh your bedroom with new bed linen, bed sheets and covers. 25% off selected bedding. TECH10 – Are you fan of the latest tech products? You could get 10% off TV and computers over £799. SEAT10 – Having a baby? Safety first. Get Car Seats with 10% off at Argos. IPAD10 or IPAD5 – You could get 10% or 5% off iPad pro 10.5" or iPad 9.7"
FLASH20 – 20% off during Argos Flash sale on selected lines only and on top of all other offers. Ended on 21st November. PCHAIR15 – 15% off all pushchairs. NURFUR10 – Buy any nursery sets in total value of £399 or more and get 10% off with this voucher code. FISHER25 – 25% off on Fisher Price Baby & Toddler. TVS10 – 10% off Tvs over £299. GROOM10 – 10% off all male grooming. CANON10 – 10% off Canon printers. KIDS15 – Spend £50 or more on children's furniture and enjoy 15% off. FURN100 – £100 off your furniture purchase of £400 or more. WILLOW25 – 25% off any Willow Tree Range products. JEWEL15 – If you didn't buy your Jewellery in August with 25% off, here is another chance, however, this code will give you only 15% off when you spend £40 on Jewellery box. After hitting the Apply button, your discount will be applied instantly (if your order is eligible). The Argos codes have usually specific rules - you have to meet a specific minimum purchase limit and/or buy eligible products from eligible categories. If you need more information about using promotional codes, check out this Argos page with a FAQ section and details on how and where to enter a code. Buy yourself some time - get months to pay for your favourite product with the Argos card. 12 months to pay on selected products from jewellery, furniture, headphones, computer, toys and more. Note: In case you don't pay in full by the end date of the plan - you will be charged interest from the date of purchase. More details about the Argos card here. Got a Love2shop card or voucher? Love2shop Flexecash cards can be spent online at argos.co.uk or in any Argos store, however, Love2shop paper vouchers can be spent in-store only. Argos deliver all across mainland UK and Northern Ireland. The costs depend on the size of your order. *Order before 6pm for the same day delivery. Valid for eligible items. The costs differ for large items, however, if you are happy with the Standard Delivery - you will not pay more than £6.95 for any order. No, Argos doesn't currently deliver abroad. Similarly to Debenhams, Argos offer in-store collection. You can reserve online and pay when you pick up instore or you can pay online and use fast collection for FREE at Argos dedicated Fast Tracks. It shouldn't take more than 60 seconds. From time to time there is a promotion when you can get a free voucher (usually £5 or £10) for using instore collection. 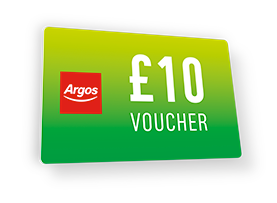 To see if there is an active voucher promotion visit Argos gift voucher page. The biggest Argos Clearance SALE is happening in January. However, they offer regular bargains on top products all year round - check this clearance page here. If you are a real bargain hunter, make sure you check Offer of The Day for Argos here (a website collecting deals from UK retailers). With more than 845 retail stores, Argos is one of the largest high-street retailers in the United Kingdom. It has been researched that 96% of the population of the UK has an Argos branch within 10 miles. Most of the Argos stores are located in Great Britain and Northern Ireland, but there is also Argos IE with 40 locations in Ireland. Argos regularly creates attractive deals and voucher codes. With a code you can save as much as 30% or £50 off, depending on the product's category. Good news: Argos allows you to enter multiple promo codes per order at checkout.